Flexible - Data can be collected on either the Windows-based or browser-based platform allowing for ease of use in any situation. 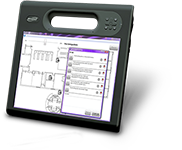 Customizable - The flexibility of inspectiTRAC allows it to fit your systems, equipment, processes and personnel. Standardizes inspection audit forms - consistency in what is inspected and how it is inspected among all inspectors and teams. Graphically depicts equipment and inspections to be completed - visual layout of locations and areas ensures no equipment is missed and increases navigation efficiency (Windows-based solution). Capture photographic evidence - the built-in camera can be used to record visuals of incidents which can be attached to an inspection/audit for submission. If needed more than one photo can be captured. Reduces data entry - computerized collection = no more manual data entry. Eliminates errors - user-friendly; easy-to-use. 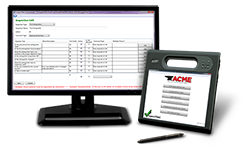 Easy access to data - inspection data is immediately available for viewing and dissemination. Eco-friendly product - reduces paper consumption and need for filling structures; saves the environment. State-of-the-art - easy-to-use, visual, touch-screen technology. Mobile - Forget about having to complete a paper-based inspections then manually enter data into a database, with inspectiTRAC data can be uploaded in real time. No internet connection? Use the Windows-based solution and datat will be saved on the device and uploaded when a connection is available. Windows-based option - inspectiTRAC is designed to run on any device running a Windows 7 or higher operating system. Options of devices range from simple, handheld devices to rugged, industrial devices developed to withstand hurricanes; the choice is yours. Browser-based option - when Internet access is available, the browser-based version allows you to take inspectiTRAC anywhere you go. After data is collected it automatically is uploaded into the data management tool. Scoring Scale Flexibility - inspectiTRAC doesn’t limit inspection data to yes/no or pass-fail; instead, you can customize the scoring to your specific needs. You have the flexibility to create a scale that works for you and provides you with the data you need. Signature verification - Inspections, audits and observations can require signature verification of completion, thus ensuring the correct person is completing the data collection. Manage inspection, observation and audit questions - inspectiTRAC’s functionality allows you to control all aspects of collection questions asked. Questions can be updated, daily, weekly or not at all, the choice is yours. Updates to questions are done in a real-time environment, allowing your system to always be up-to-date. Update Questions - Browser-based administrator allows you to update questions during data collection. Once the change is made the updates are available in the forms your users are viewing. Manage forms - Windows-based system allows you to control forms online oroffline mode if needed. Ensure document control - With inspectiTRAC, you no longer have to worry that your inspectors/auditors are using the right form. inspectiTRAC Administrator doesn’t allow access to old versions of forms, ensuring you are always are using the correct form and receiving the correct data. Update facility maps (Windows-Based Version) - If you wish to add, remove or change a location of an item or inspection group, inspectiTRAC allows you to make that change on the fly. Simply log into inspectiTRAC administrator, change the info on your map and be on your way. No waiting for technical support to update your data file or paying for a system update; you manage your system and customize it to meet your needs. Not looking for a visual inspection system? No problem, inspectiTRAC data collector works with or without the visual mapping. Schedule inspections, audits and observations - ensure that all data collection requirements are completed. inspectiTRAC Manager allows you to schedule everything, taking the worry of managing the schedule out of your hands. With a just a few clicks, you can set up your schedule and customize it based on the specific needs of that audit, inspection or observation. Custom notification - Concerned that your data is not being collected? inspectiTRAC Manager allows you to create notifying messages to provide you with the certainty that the data you need is being collected on time and by the appropriate person. Custom reporting - Many standard reports are available to help you see your results, all in real-time. Instead of waiting administrative staff to manually enter data, you can view collected data instantly. Permissions to view reports & dashboards and/or access to data can be given to anyone in your organization and based on a company hierarchy. Custom reports and dashboards available upon request. Identify corrective actions - failed inspections are documented, tracked and managed. Documents audit trail - records of audits and inspections are stored in a secure, manageable database, ensuring an accurate and complete audit trail.